Institute manager Paddy McLaughlin has insisted that he is not surprised Crusaders boss Stephen Baxter is showing no signs of panic despite a poor start to the season for the champions. The Crues travel to play Stute at the Brandywell today having suffered their fourth defeat in eight Danske Bank Premiership clashes against Dungannon Swifts in midweek. 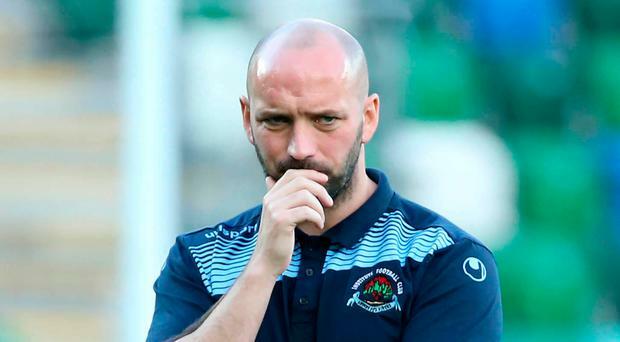 While there is obvious disappointment at Seaview over how things have gone so far, leaking two goals per game, Baxter said this week that he wasn't too concerned - and McLaughlin understands why. "Stephen Baxter is probably relaxed about how things have gone because he trusts his players that they will turn things around," McLaughlin insisted. "They can beat anyone at any stage and he is not panicking because the players are as good as anyone in the division. "It's uncharacteristic of them to be conceding soft goals because they have quality defenders and top players in their ranks. It's not like them to be conceding so many goals and I just hope today they concede another couple." By Graham Luney Crusaders chairman Ronnie Millar has added his voice to calls for more assistance from the Irish FA to help clubs deliver in Europe. By Gareth Hanna Crusaders manager Stephen Baxter has hit out at what he views as 'jealous' onlookers to his side's recent successes. By Alex Mills Jordan Stewart has gone from zero to hero - and admits there is no better feeling. By Graham Luney Crusaders captain Colin Coates says he has feared for players' safety at certain moments in his career.